The best diet for rabbits consists of grass, fresh fruit and vegetables, meadow/timothy hay and water. Offer 2-3 plates of different veggies a day and smaller amounts of carrot and fruit, which are high in sugar. Hay and water should be available at all times. 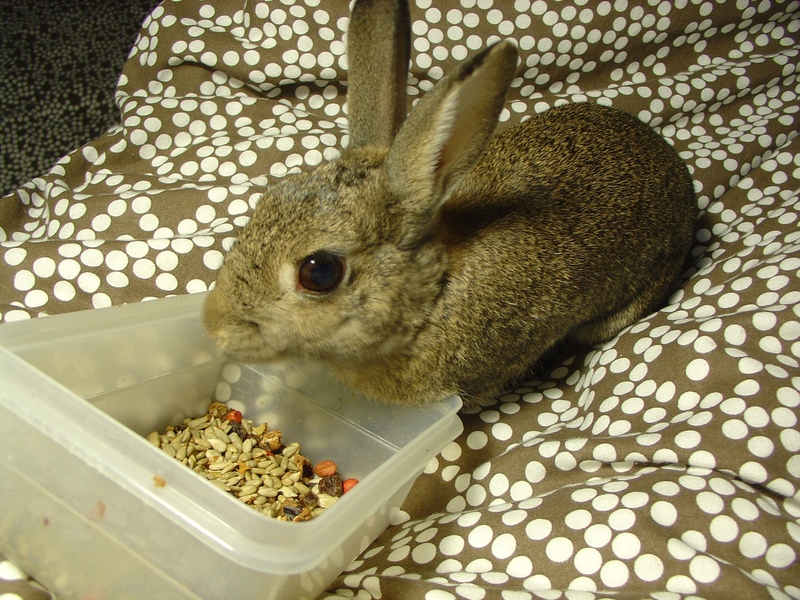 You can also provide your rabbit with other sources of fibre such as apple and willow twigs, dried grass, straw (which some rabbits prefer to hay), and chew toys made of untreated willow, seagrass, wood, maize leaves, etc. Most rabbits adore alfalfa hay, but due to the high calcium and protein content, you should feed just a handful a day to adult rabbits, while growing rabbits can have unlimited quantities. We put it in a wire cube or ball so the rabbits have to work a little to get it out through the holes. If you have a garden, let your rabbits graze on grass, clover, plantain, dandelions and other plants. Convenience (dried) food is not recommended for most rabbits if you feed a healthy and varied diet as described above. It does not wear the teeth down as much as grass and hay and causes messy droppings in some rabbits. Our foster rabbits (including babies) have been on a grass, hay, fruit and veggie diet for several years with excellent results. Even mature rabbits with established dental problems have benefited from this diet, requiring fewer tooth-trimming operations and living longer as a result. Foster rabbits with no incisors used to eat a small handful of pellets a day and chopped fruit and vegetables. Now they don’t get any dried food, they make an effort to nibble on grass, hay, clover, dandelions, strawberry leaves, potted herbs (parsley, dill, basil, sage, etc. ), geraniums, campanulas and other plants. It’s wonderful to see them graze for several hours a day, displaying more natural behaviour. None of them has lost any weight as a result of the change in diet. Feeding fresh food can be expensive and time consuming, but we believe this will result in fewer veterinary bills and painful health problems for your rabbits. If you cannot afford to buy fruit and vegetables, you can feed your rabbits (dried) grass, unlimited meadow or timothy hay, straw, small amounts of alfalfa hay, wild plants such as clover and dandelions, and apple and pear twigs. Rabbits are very sensitive to digestive problems so it is essential to make any changes in the diet very gradually. Using a probiotic in the water will help establish the right gut bacteria at these times. Every rabbit needs a treat from time to time, but avoid unhealthy ones from pet shops and feed them in moderation. Our rabbits love the occasional peanut, raisin or a few sunflower seeds (which make the fur very soft). They also enjoy dried carrot and apple rings and a very small piece of brown toast. Feed your rabbits at least 4 different types of fresh foods daily and change the selection from time to time so your rabbits do not eat the same things every day. Introduce new items one at a time, gradually increasing the quantity. We feed our rabbits apple, banana, basil, beetroot, bok choi, broccoli, Brussels sprouts, cabbage, carrot and carrot tops, cauliflower, celery, celeriac, chicory, Chinese leaf, coriander, courgette, cucumber, dill, endive, fennel, grapes, kale, kohlrabi and its leaves, lettuce, melon, mint, mustard greens, nectarine, orange, pak choi, parsley, parsnip, peach, peas (including the leaves and pods), pear, pepper, pumpkin, radish greens, raspberry, rocket, sage, spinach, strawberry, swede, sweetcorn (in moderation as it is fattening), Swiss chard, green and red tomatoes, turnip, watercress and watermelon. Do not feed apple and pear cores (the pips are poisonous), beans, tomato leaves, potato sprouts and rhubarb.